Another island favorite that has recently re-opened after closing its doors two years ago is the Lafayette Club. Built almost 30 years ago in the shade of sea grape and coconut palm trees on the beach at Grand Cul-de-Sac, the restaurant is popular not only for its enormous pina coladas and its classic French and fresh seafood menu but also for its trendy boutique and daily fashion shows. 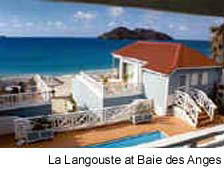 Lafayette's swimming pool (the first pool on the island) is available to guests. Diners can star gaze at the many famous fellow customers or simply enjoy the view of the blue lagoon stretched out before them. If you want a break from the fine French feasting and feel like leaving the designer clothes and high prices behind head down to the southern edge of the harbor in Gustavia and duck behind the old stone wall. Eddy's is literally a hole in the wall with a relaxed, enjoyable environment that offers a terrific menu at reasonable prices. We hadn't been there in five years and were happy to find very little had changed inside the lush, tropical refuge just off Gustavia's busy main streets. Although we were tempted to try something new, we had to have an order of stuffed cristophine and stuffed crab. Like Eddy's, these dishes are just something you shouldn't miss. We added a spinach and goat cheese salad and fresh fish grilled in ginger to our order and kicked back to enjoy one of our most relaxing and delicious meals on the island. The Hideaway, widely known as Andy's, is another reasonably priced, low-key, self-effacing ("Warm beer, lousy food, view of the parking lot"), excellent choice for an entertaining and tasty meal on St. Barts. Famous for thin crust California pizzas and for owner Andy Hall's good humor (we spotted an employee's t-shirt that read "Five Year's in business, still lousy"), the Hideaway is where the locals gather for good times and good food. After scallops Provencal or fresh fish grilled over hot stones right at your table, try the Colonel – a lime sorbet topped with a shot of high quality vodka. Whether or not you opt for the Colonel, don't skip the bottomless carafe of vanilla rum brewed on the premises. 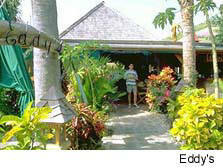 Andy's also offers a take-away menu, perfect for lunch at the beach or dinner in your villa. There are several other tantalizing choices around the island for take-away meals. Kiki-e Mo, a gourmet deli in St. Jean makes wonderful panini sandwiches and offers private catering. La Rotisserie, another gourmet shop in St. Jean, has a terrific selection of olives, olive oils and wine along with our favorite gourmet mustard Heidea and a tasty potatoes dauphinoise. Petite Colombe in Colombier and Lorient and La Rotisserie in St. Jean and Gustavia offer terrific take-out meals. We had creamed spinach and pizza one evening from La Rotisserie and were tempted by the rice salads, whole cooked hams and rotisserie chicken. The pastries, including quiche, scallops in puff pastry and fresh fruit tarts, rival those of Fauchon in Paris. It seems ironic that the place where we had our first meal on island should be the last place we mention, but no synopsis of St. Barts dining would complete without a round of applause for La Langouste. 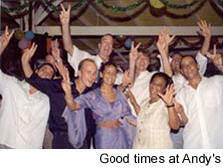 Owner Annie Ange is the true soul of St. Barts and her restaurant reflects her love for and her loyalty to her island heritage. As unpretentious as it is delicious, La Langouste is tucked into the Hotel Baie des Anges on Flamand's Beach. The dining area is awash with a seemingly endless selection of blues – the blue décor reaches to the edge of the blue swimming pool, which stretches out into the blue of the ocean beyond. A true feast for the soul follows this feast for the eyes. We started with Accra, an island specialty of fried cod fritters served with spicy piments sauce. This was followed by a sublime citrus and lobster salad. Grilled whole lobster at La Langouste is served fresh from the lobster tank on the premises. Three sauces are available for dipping: ginger and tomato, Creole sauce or clarified butter. Sweet potatoes, baked plantains, pureed squash and basmati rice are offered on the side. A warm banana tart and a jigger of the island’s vanilla rum are a nice way to round out one of the best meals (and reasonably priced evenings) you’re likely to find anywhere on the island. Several clients have told us that during their stay they ate two or three times at La Langouste. And that is truly the challenge presented to the St. Barts visitor: You find a great place to eat that you absolutely love, then you discover that, on St. Barts, there"s a dozen others just around the corner. Good Luck!